Matrices questions are usually presented as a grid of symbols. The grid can be either 2 x 2 or 3 x 3. Working left to right and up and down scan the symbols to observe similarities and differences between them. All 3 matrix clue symbols have a solid external black line, so do all the answer symbols. All 3 matrix clue symbols have a white fill, so do all the answer symbols. All 3 matrix clue symbols contain identical arrow heads, all pointing to the right. The 2 matrix clue symbols on the left have the same outline shape as each other, being 4 pointed stars. The one on the right is a 5 pointed star. What logical steps can we make when we apply these observations to find the missing Matrix symbol? 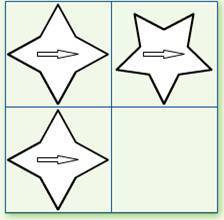 Observation 3 indicates the missing symbol will contain an arrow head pointing to the right so we can discount answers c and d.
Observation 4 indicates that the missing symbol is a 5 pointed star. We can now discount answer b and e.
Following these two observations, answer a is the missing Matrix symbol. All 8 matrix clue symbols have a solid external black line, so do all the answer symbols. All 8 matrix clue symbols have a white fill, so do all the answer symbols. All 8 matrix clue symbols contain arrow heads, all pointing to the right top corner. Each row contains 3 distinct types of arrows. Each column contains 3 distinct types of arrows. Each shape is a hexagon. What logical steps can we make when we apply these observations to the task of finding a missing symbol? 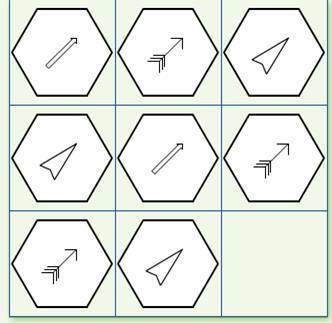 Observation 4 indicates the missing symbol will contain an arrow head of the type seen in d, so we can discount answers a and c.
Observation 6 indicates that the missing shape is a hexagon. We can now discount answer d.
Observation 3 indicates that the arrow should point to the top right. We can now discount answer e.
Following these two observations, answer b is the missing Matrix symbol.